This photograph at Deepwater in the Northern Tablelands shows a sign that lures tired motorists with the promise of a rest area ahead. City walls and city gates are ancient phenomena, as old as cities themselves and a vital element in their control and governance: in collecting taxes, resisting contagion and excluding real or perceived troublemakers. But the most important role of past city gates was representational: a signboard conveying public information, a surface for the display of power through heraldic shields and ornament and a means of warning – telling citizens and visitors what would befall them if they disobeyed the rules of the city. The fortified walls of most cities have long been dismantled by shifts in technology, city gates giving way to train stations, airports and freeways. In the contemporary city the real boundaries are virtual: the interface of the screen and the camera, the security regimes of high-tech surveillance and the virtual information space of the internet. In Australia there has never been a walled city as such. 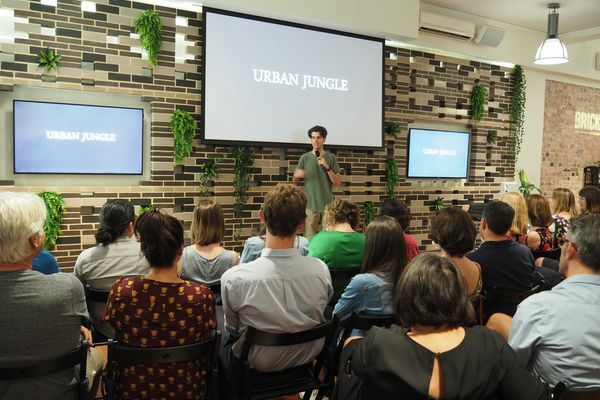 Of course there have been borders and fortifications of various kinds: historically, one thinks of Brisbane’s Boundary Streets, which marked the line of curfew within which Aboriginal people were not permitted after dark. But the things that really condition the entry experience into an Australian city these days are distance and speed. Oh, and for those travelling by car, vernacular roadside town signs. 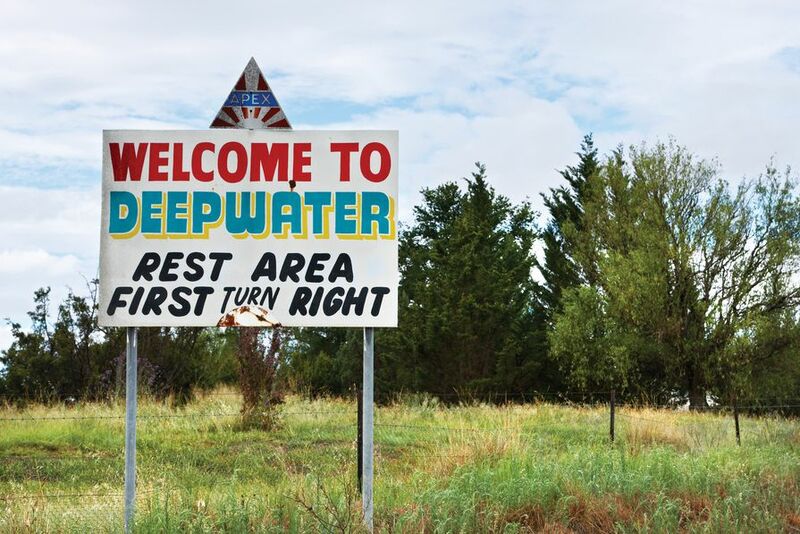 Back in early 2010 photographer Dianna Snape undertook a photographic documentation of town welcome signs throughout rural New South Wales and Queensland. Several of the photographs depict signs that have since been replaced, but their sentiment and Snape’s photo essay are still worthy of reflection. Sometimes the signs are quite taciturn in this, presenting nothing more than the placename. More commonly they will preface this with “Welcome to,” usually smaller and in a curling serif font as if the “welcome” was personal, a spoken direct address, while the name was official business. 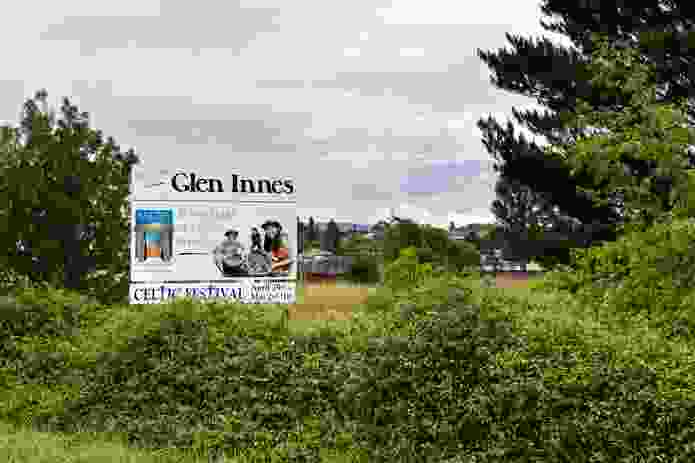 These signs are billboards, of a sort, but their signification reads differently from commercial advertising because they are not selling a product, but rather a location – selecting its most characteristic attributes and presenting them in an abbreviated visual style, readable at speed, to the jaded passer-by gazing through a car window. The hope is that such features will cause someone to slow, to stop, to pass some time. Snape’s photograph taken in Glen Innes, in the New South Wales Northern Tablelands, offer a teasing glimpse of a popular local activity – fossicking for sapphires. Snape’s photograph taken in Glen Innes, in the New South Wales Northern Tablelands, shows a town sign with a well-coordinated place-branding campaign referencing the town’s claim to fame as the Celtic Capital of Australia and giving a teasing glimpse of a popular local activity – fossicking for sapphires. 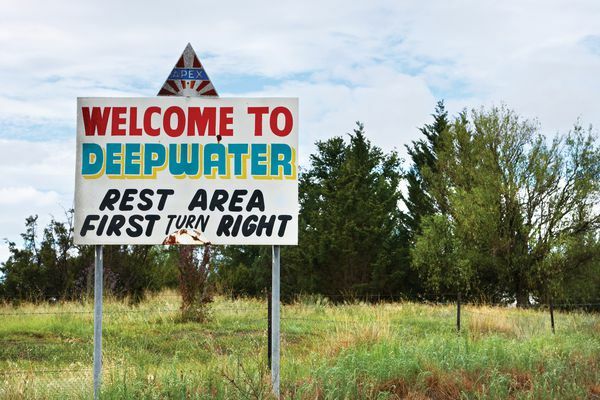 Such signs attempt to mark out their town as a destination, more than just a drive-through. 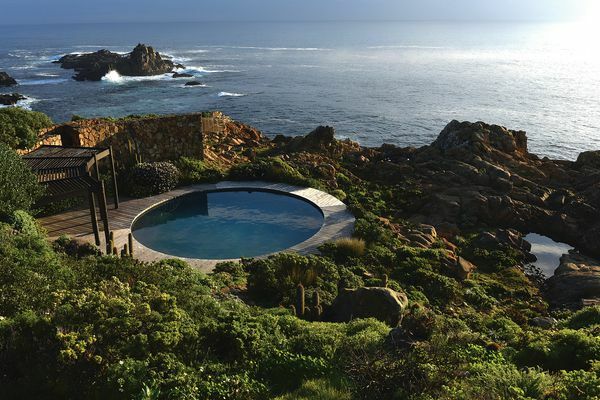 There is the hope of tourists, of course, but also the seizing of more prosaic opportunities. 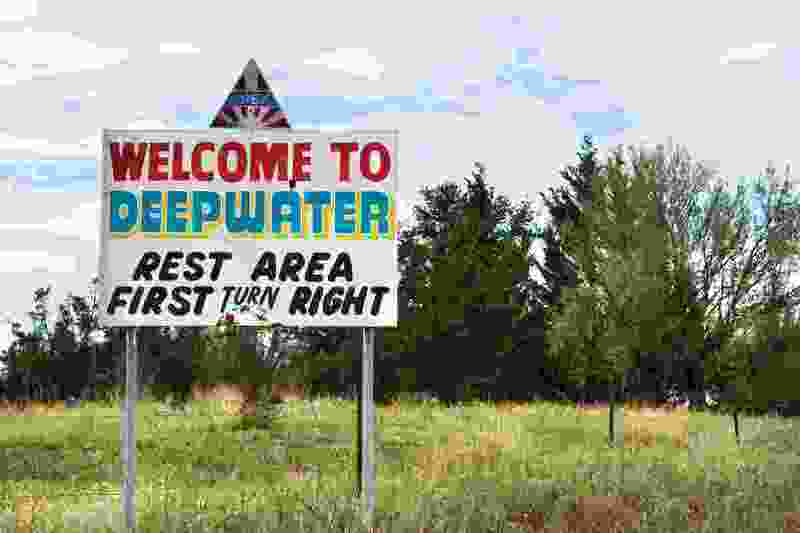 The photograph at Deepwater, also in the Northern Tablelands, shows a sign that lures tired motorists with the promise of a rest area ahead. 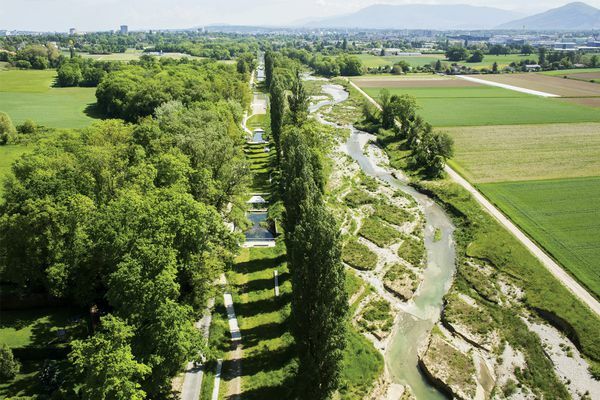 This is a public service, but also an attempt to slow the rapids of vehicular traffic, to produce an eddy in the current of people, and currency, flowing past on the roads and highways that crisscross our wide brown land. The town sign for Bli Bli on Queensland’s Sunshine Coast welcomes visitors to “Beautiful Bli Bli, first settled 1868,” in a message ornamented with butterflies. The “vernacular” character of the signs Snape has documented, their ad-hoc, locally produced design and production, gives them the charm of idiosyncrasy, rather than having the uniform visual style of a centralized tourism agency or official road signage, they are part of the local colour, sometimes quite literally. They are wildly diverse in size, shape, wording and selection of images, and also in their message, their way of saying welcome. Some are also decidedly hokey, and such a handcrafted directness is one of their great charms. 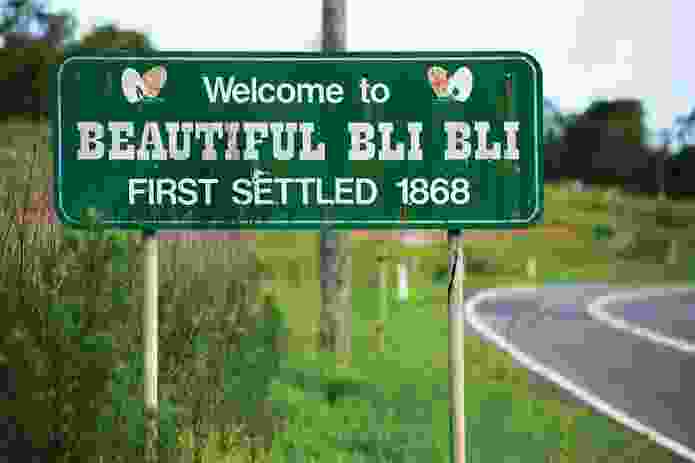 For instance, the town sign for Bli Bli on Queensland’s Sunshine Coast welcomes visitors to “Beautiful Bli Bli, first settled 1868,” in a message ornamented with butterflies. Equally bespoke are the signs for the Sunshine Coast towns of Kenilworth and Yandina, each emphasizing its scenic mountain setting with a skyline silhouette and local features in the foreground – windmills and trees in Yandina, cows grazing in Kenilworth. 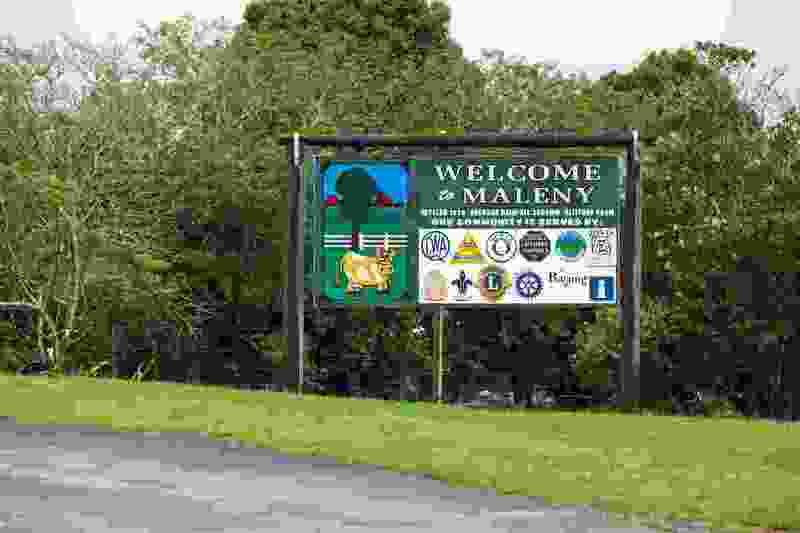 A cow also appears on the Maleny sign, though in a curiously cartoonish guise. 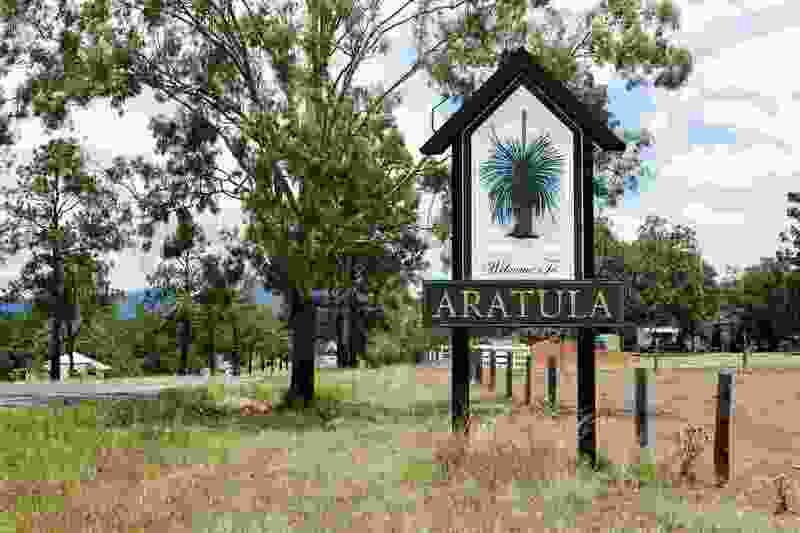 Aratula, also in Queensland, has experimented with a gable-end form, following the line of the Xanthorrhoea plant depicted. The high point of such formal play in all the signs in the photographic essay is the steam train, complete with carriages, that is the “Welcome to the Southern Downs Region” sign – a tourist attraction in itself. Aratula, in Queensland, has experimented with a gable-end form, following the line of the Xanthorrhoea plant depicted. 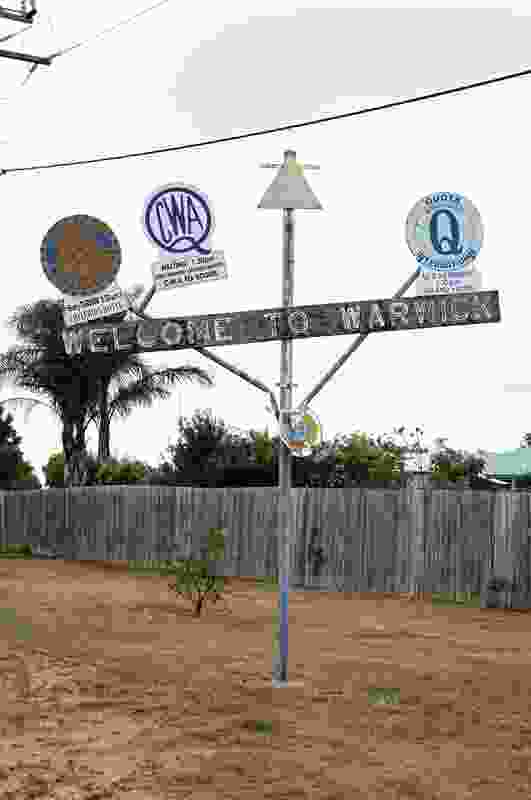 In South East Queensland, Warwick is the “Rose and Rodeo city,” as the large red bloom on its sign attests. The town has its own species of rose and is famous for the blooms throughout its parks in spring. Not only does the sign welcome visitors to “our” city in flowing cursive script, but also to our “lovely” city – a rare superlative. This contrasts with two other Warwick signs: one found on the outskirts of town, a rather sad tourism authority sign promising information five kilometres ahead, and the other a rickety crucifix sprouting the shields of the town’s service clubs: Rotary, the Country Women’s Association, Lions, Apex, Quota International. In Warwick, Queensland, a rickety crucifix sprouts the shields of the town’s service clubs: Rotary, the Country Women’s Association, Lions, Apex, Quota International. It was Gertrude Stein who said, upon visiting her childhood town of Oakland after thirty years away in Paris, that she went there only to find that “there was no there there.” Her comment has been widely understood as an accusation of the place having no resonance or character. 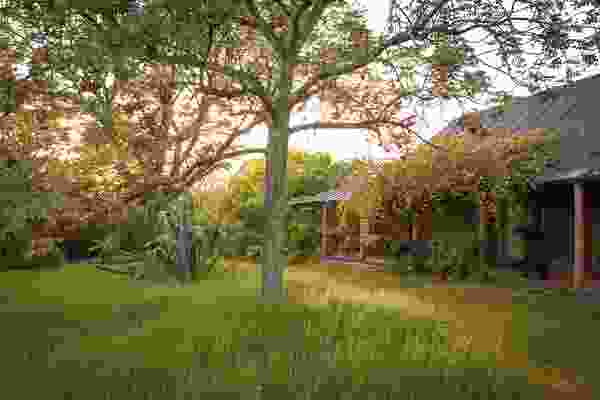 But her actual meaning was that the specific places of her childhood – her old house, her old school – no longer existed; there was no there there. In Australia, the anxiety that a there should also be a there is palpable. 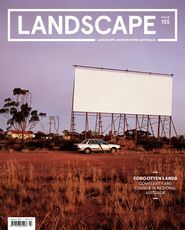 Snape’s essay shows us the intensity with which the entry gesture, the city limits sign, the gateway experience, the naming of the town, all become key elements in defining a place as such – in naming the there that’s there. A cow appears on the Maleny sign, though in a curiously cartoonish guise.